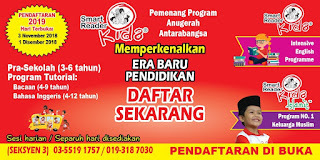 Welcome to 'Smart Reader Kids, Seksyen 3 Shah Alam - Selangor Malaysia' website. We hope that this website could serve you useful information about us and programs that we offer. Feel free to navigate around. Registration Intake for Year 2019! Valued parents, in the month of December 2018, we'll be having our Open Day to be held at our center. For parents who'd like to inquire about our program (preschool or tutorial), this would be a great time to learn more about what we do. Throughout these years, we found that our children had benefited greatly from our preschool and tutorial program, where they had built a strong foundation and been carried out to their primary school as well as Islamic primary school. In a way, they had been in top tier class of their respective primary school. This had been consistent trend for our children since the center commenced back in the early days. RSVP us or contact us for more details! Registration Intake for Year 2018! Valued parents, it is approaching towards year end 2017. As always, we are now OPEN for Preschool and Tutorial registration for year 2018 intake! Valued parents, in the month of December 2017, we'll be having our Open Day to be held at our center. For parents who'd like to inquire about our program (preschool or tutorial), this would be a great time to learn more about what we do. Registration Intake for Year 2017! Valued parents, it is approaching towards year end 2016. As always, we are now OPEN for Preschool and Tutorial registration for year 2017 intake! School Holiday Program in December 2016! * Rebate RM20 for early bird registration before 3 Dec'16! Valued parents, in upcoming month of November and December 2016, we'll be having our Open Day to be held at our center. For parents who'd like to inquire about our program (preschool or tutorial), this would be a great time to learn more about what we do. School Holiday Program in June 2016! Kids to build up skills in their English literacy on Spelling, reading fluently and vocabulary! * RM20 Rebate to first 10 Participant! Kids to build up skills in their 'B. Malaysia' literacy on spelling, reading fluently and vocabulary! Let your children engage some productive holiday break with us and improve their English or 'Bacaan' reading skills with our Intensive Reading Classes, as well as making new friends! Seats are limited. Contact us to know more about the programs. See you there! Registration Intake for Year 2016! Valued parents, it is approaching towards year end 2015. As always, we are now OPEN for Preschool and Tutorial registration for year 2016 intake! For parents who are interested to enroll their children in one of our programs, do register early as some classes are already full. Call us or visit us for more info and don't forget to ask us about our Registration promotions! Give your child a head start! 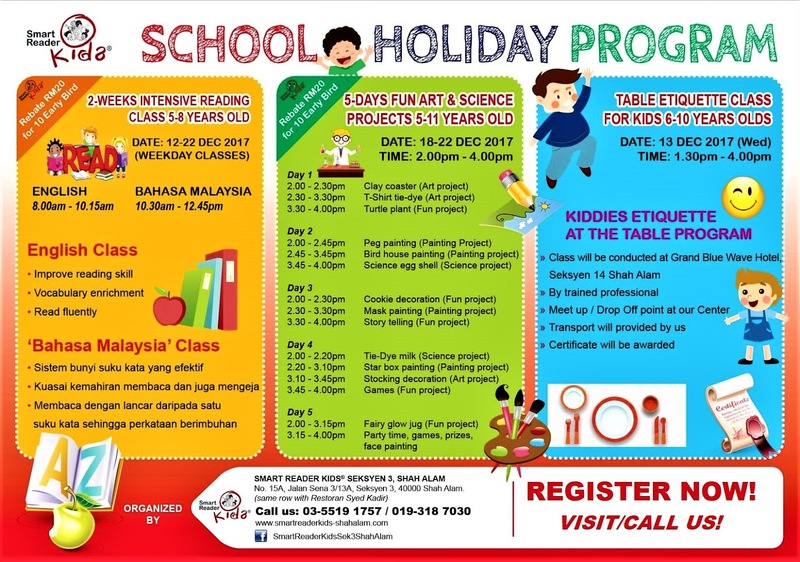 School Holiday Program in December 2015! * Rebate RM20 for first 10 Registration! In upcoming month of October and November 2015, we'll be having our Open Day to be held at our center. For parents who'd like to inquire about our program (preschool or tutorial), this would be a great time to learn more about what we do. Briefly, we help develop kids in nurturing their early learning foundation through our award winning preschool and tutorial program. Thousands of kids has benefited from our program by building that strong foundation and being carried well into their primary school phase. Preschool 5-Days Free Trial 2015! Valued parents, have your children been to preschool or was thinking to send them for one in near future? Have they been able to steadily pick up the skills in reading, be it in English literacy, 'Bacaan', 'Jawi' and 'B.Arab' or even Mandarin, and of course advancing excellently in other preschool activities? If you're still searching for it, you could try our 5-Days Free Preschool Trial (Age 3 - 6 years) and learn more about our program either English Medium preschool program or the Islamic preschool program, that are comprehensively catered to the young learners in Fun, Creative and Effective way! Thousands of children had benefited from our program with them having build a solid learning foundation that are being carried to their primary school level. We have now open the 5-Days Free Preschool Trial starting from May 2015 until throughout the year. Do drop by at our center or contact us for inquiries! Please click link below for further information on our preschool program or to request for the Free Preschool trial. See you there! Dear parents, as for children that would like to polish their existing literacy skills, we have now open the mid year 2015 intake for our tutorial students. Briefly, our tutorial program is held once a week, with 2 hours span per session that could help the young learners to build and enhance their existing literacy skills, level by level. Try us out, do contact us or drop by at our center for any inquires or to register for our upcoming tutorial program intakes! Please click link below for further information on our tutorial program. See you there! School Holiday Program in June 2015! Valued parents, it is approaching towards year end 2014. As always, we are now OPEN for Preschool and Tutorial registration for year 2015 intake! School Holiday Program in December 2014! * Free Children Dictionary to first 5 Participant! 3-Days Art & Science Activities for Kids! Kids to explore 11 fun & mind-boggling creative projects! * RM10 Rebate for registration before 5 December 2014! Let your children improve their English or 'Bacaan' reading skills with our Intensive Reading Classes, learn and explore fun creative projects in our Art & Science Program during the school holiday while meeting new friends! Seats are limited. Contact us to know more about the programs. See you there! Parents, we have now open our pre-registration for Preschoolers and Tutorial intake 2015. Simultaneously, we'd like to invite all Parents and Children to our OPEN DAY! As always, there will be great promotion offered for pre-registration made during the day. Also, there'll be other fun children activities to be held on the day. Some snacks and door gift will also be given to the kids. So, come visit us and join in the fun. See you there! School Holiday Program in June 2014! * Free Children Dictionary for Early Birds registration! 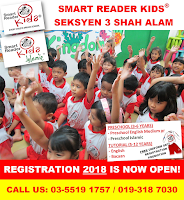 Let your kids enhance their literacy either in English or Bahasa Malaysia during school holidays in fun and effective way while making new friends! Seats are limited. Please contact us to learn more about these programs. See you there! Preschool & Tutorial Promotions (April to June 2014)! Valued parents, as part of our effort to enhance children learning in their early educations, we are running a campaign in the month of April to June 2014, having a promotions for both of our Preschool and Tutorial programs alike. So check out our programs and center during the months and learn more about how our programs could benefit your children in their tender years of learning! Please click here to learn more about our promotions! Parents, it is approaching towards year end 2013. As always, we are now OPEN for Preschool and Tutorial registration for year 2014 intake! For parents who are interested to enroll their children in one of our programs, do register early as some classes in preferred session is already full. Call us or visit us for more info and don't forget to ask us about our Registration promotions! Give your child a head start! School Holiday Program in December 2013! Kids to explore and make discoveries with our 12 Fun 'Art & Science' projects! * RM10 Rebate for registration before 2 December 2013! 2-Days Sushi and Creative Cooking for Kids! Kids will learn to prepare Sushi, craft up fun Sandwiches, Cake in a Jar & yummy Tutti Fruity! Let your children explore their creativity with our fun 'Art & Science' projects or the Sushi Making and Creative Cooking class during the school holiday while meeting new friends! Seats are limited. Please contact us to know more about the programs. See you there! Parents, we have now open our pre-registration for Preschoolers and Tutorial intake 2014. Simultaneously, we'd like to invite all Parents and Children to our OPEN DAY! As always, there will be great promotion offered for pre-registration made during the day. Don't miss our Clown performance scheduled 3-5pm on the Open Day. Also, there'll be other fun children activities to be held on the day. Some snacks and door gift will also be given to the kids. So, come visit us and join in the fun. See you there! 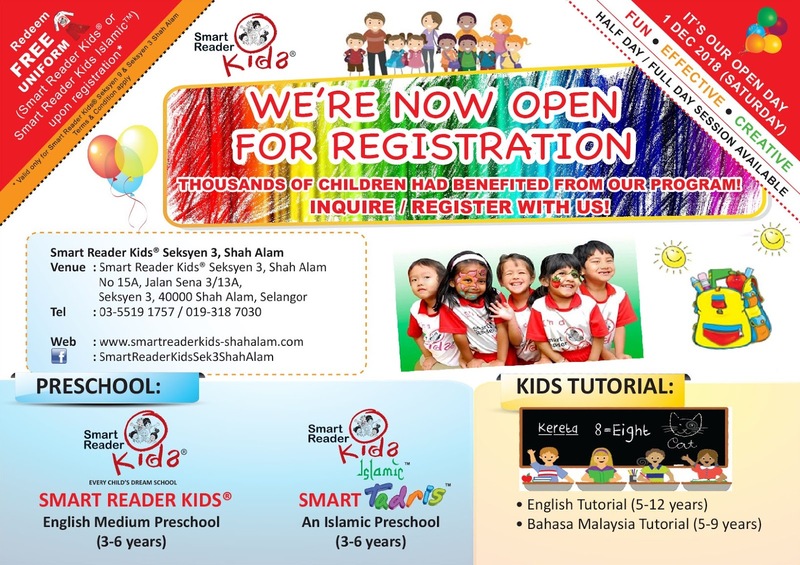 Introducing Smart Reader Kids Islamic™ 2014! 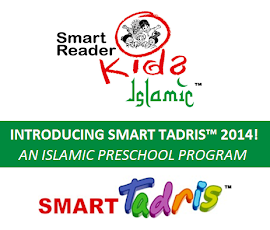 Valued parents, aside from our Smart Reader Kids® regular preschool program, we are pleased to announce that we'll be introducing a NEW program Smart Tadris™, an Islamic Preschool Program that embraces Islamic preschool learning that will commence in January 2014. The program is suitable for parents who'd like their children to have an Islamic based learning during their preschool years. Without compensating our Smart Reader® English, Bacaan, Maths and other essential academic learning into the Islamic timetable, children could benefits greatly from this program! The program will be conducted in the afternoon session. Please view the latest advertorial here or click Smart Tadris™ program for more details! 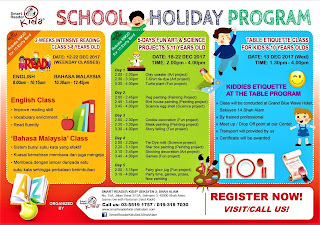 School Holiday Program in June 2013! Kids to improve their reading skills foundation! Kids to improve their 'Bacaan' skills foundation! Kids to prepare and bring home 5 Fondant Cupcakes, 5 Mini Pavlova & 5 Mini Tiramisu! Explore clay creativity and bring home Key Hanger, Candy Jar & Bookmark! Let your children improve their reading and 'bacaan' skills with our Intensive Reading Classes, learn and engage fun Bakery Activities or explore creativity in our Clay Project Class during the school holiday while meeting new friends! Seats are limited. Contact us to know more about the programs. See you there! Parents, it is approaching towards year end 2012. As always, we are now OPEN for Preschool and Tutorial registration for year 2013 intake! For parents who are interested to enroll their children in one of our programs, we recommend to make registration early as some classes are already full. Call us or visit us for more info and don't forget to ask us about our Registration promotions! Give your child a head start! School Holiday Program in December 2012! 3-Days Art & Science Camp! Fun Activities with friends exploring Arts & Science Projects! 2-Days Tart Making & Cake Decoration Class! Fun Hands-On bakery activities for kids to explore! * Free Children Coin Box for registration of any of the Program before 8 Dec 2012. Let your children explore their creativity on our Art & Science Project or engage with fun Bakery Activities during the school holiday while meeting new friends! Seats are limited. Contact us to know more about the programs. See you there! Parents, we are now open for preschoolers pre-registration intake 2013. 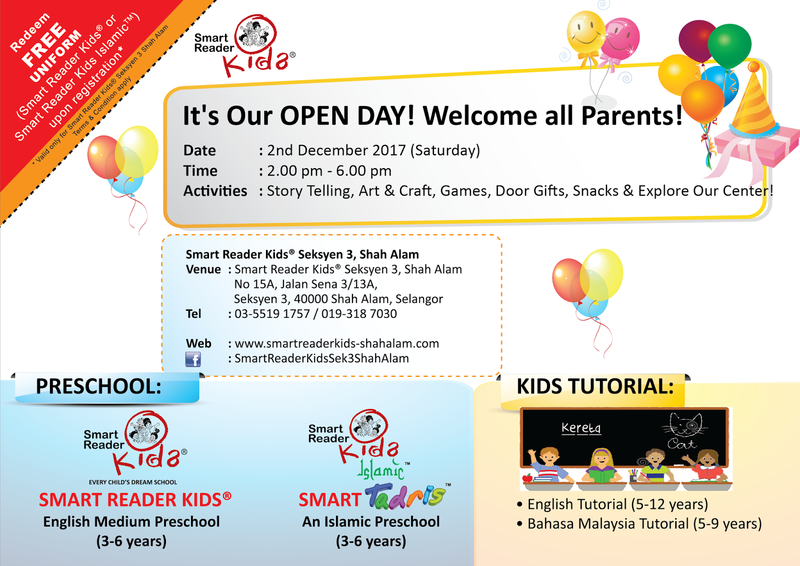 Simultaneously, we'd like to invite all Parents and Kids to our OPEN DAY! As always, there will be great promotion offered for pre-registration during the day. If your children loves magic show, don't miss our Clown performance scheduled 3-5pm on the Open Day. Also, there'll be other fun children activities to be held on the day. Some snacks and door gift will also be given to the kids. So, come visit us and join in the fun! Happy celebrating 55th 'Merdeka' Day to all Malaysians. It is a great day for all of us. We at center had prepared some decorations as an appreciation for this special day. Click here to see our activities! For this special season, the kids at the center had prepared some greeting cards and decoration to celebrate the festival. Aside from that, we also had a Hari Raya as well as birthday celebration at our center. It was an enjoyable day for us! Click here to see the photos. It's Father's Day! We'd like to take this opportunity to wish all dad out there to have a wonderful day especially with the family. The kids at the center had come up with a creative gift for their dearest daddy. Click here to find out! Plenty of event happenings at our center in May 2012. This is the month where we celebrate mothers, teachers as well as the Smart Reader Kids day and held our yearly sport event, themed 'Mini Olymphaton'. Yakult had also visited the kids this month for an informative session. Please click link below or our Events tab to view the event! 3. 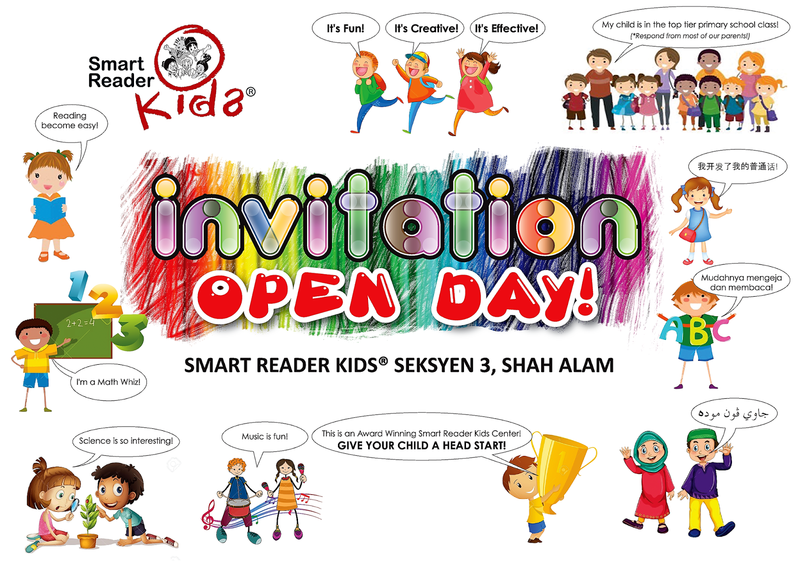 Smart Reader Kids Day! 5. Sport Day 'Mini Olymphaton'! School Holiday Program in June 2012! Let your child improve their Reading Skills during the holiday while meeting new friends! Please contact us to know more about the programs. See you there! It's World Book Day! As usual, we would celebrate this day with a free and easy reading session at our center, a yearly affair for us we would say. A light reading and storytelling session for the children and the teachers. Please click here to view the session. For our first preschool trip this year, we had brought the kids to Aquaria KLCC with some ideas for the children to see real live sea creatures and explore this amazing world! It was an educational trip and it sure had left us breathless! Please click here to see the excursion photos. Iqra' Daily at Our Center! Fardhu Ain & Mandarin Announcement! Some parents had recently asked on our coverage of Fardhu Ain subject. We're please to share and enlighten parents that our Fardhu Ain covers the following: Solat, Aqidah, Jawi & Reading Muqaddam. The aim is to embed some strong knowledge on Islamic teaching in Muslim children and at the same time preparing for a strong ground for those who plan to enter 'Sekolah Agama' in their primary school. We'd like to inform that our Mandarin Tutorial has been shifted to Wednesday (8 - 10pm) to avoid clashes of time in Saturday with other tutorial subject. The new teacher that recently joined us had a 25 years of experience in teaching preschool Mandarin in an effective way. Click here to learn more about our Mandarin Tutorial details! For tech savvy parents, you can now check in at our center using Foursquare! Be it for mayor post or gaining some points in your Foursquare account, we will add in some 'Specials' in certain promotional period in 2012. During the period, just check in at our center via Foursquare and show us your phone to redeem the 'Specials'. So look out for these specials. You can find us at Foursquare here! It's the start of year 2012! Welcome back to school children. Hope you had a very good holiday break and ready for another excitement year with us. To new student, we'd like to extend our warm welcome to your new school. It'll be fun year with lots of learning activities plan for this year. For parents, we had posted our Academic Calender 2012 in the web for ease of reference. Please click here to view the calender. 2011 Year End Party with McDonald! It's year end of 2011! We had some party with the kids on the last day of school, partly to celebrate September to December birthday babies. This time, McDonald had joined us to give some talks on 'Knowing Manners'. Please click here to view the session. The teachers at the center would like to take this opportunity to wish all children and parents a Happy New Year and to have a good holiday break! Parents, we have now open for preschool and tutorial registration for year 2012 intake! For parents who are interested to enroll their children in one of our programs, we recommend to make a pre-registration early due to limited seats available. Pre-registration and seats can be reserved with a minimal fee of RM50. Give your child a head start in their early education! School Holiday Program in December 2011! * Free Dictionary for registration before 5 Dec 2011. * Free Children Globe for registration before 5 Dec 2011. 2-Days Cupcakes & Cookies Class! * Free Coin Box for registration before 5 Dec 2011. Let your children improve their Reading Skills, expand their knowledge in Science or explore Bakery Talent during the school holiday while meeting new friends! Seats are limited. Contact us to know more about the programs. See you there! Graduation and Annual Concert 2011! You guess it, it's the graduation for S6 students as well as the annual performance event for students of Smart Reader Kids Seksyen 3 Shah Alam. Held at Management Science University (MSU), Seksyen 13 Shah Alam, we think the kids perform very well and most importantly had fun while at it. Congrats to all S6 student for your graduation! Please click here to view the event pictures. Our Center received an Award 2011! In month of October '11, Smart Reader Worldwide had held their annual event celebrating Smart Reader Kids' franchisees. The dinner event was held at the Palace of the Golden Horses, themed Mystery@11. During this event, among other centers, our center was given an honor to receive a Platinum Award. It was a great achievement for the center. Please click here to view the event. Parents, we are now open for preschoolers pre-registration intake 2012. Simultaneously, we'd like to invite all Parents and Kids to our OPEN DAY! As always, there will be great promotion offered for pre-registration during the day. Also, there'll be some children activities to be held on the day. Some snacks and door gift will also be given to the kids. So, come visit us and join in the fun! Its double celebration in August month this year. A back to back 'Hari Raya Aidil Fitri' festival and the celebration of our national Independence Day on 30th and 31st August 2011 respectively. The kids work in a team and had made a colorful 'Merdeka Raya' card as a momento for this dual celebration. Please click here to view the results! As for 'Hari Raya' celebration, we had held a get together session among the kids and a birthday bash to celebrate June to September babies! Please click here to view the session. 'GET TO KNOW US' Month! In July, we had launch a promotional invitation 'GET TO KNOW US' month. Parents can send their children for a 2-Weeks FREE tryout on Smart Reader Kids Preschool Program or FREE tryout on English Tutorial Session to know more about the program. Contact us for more information on the promotion. Ronald and his crew had recently came to visit our center. On this visit, they had come to give some talk on safety matters to the children. Please click here to view the session. For this year field trip, we had brought the kids to Petrosains KLCC where they could explore the wonder of science world. It was fun and knowledgeable trip for all of us. Please click here to see the excursion photo. Happy Father's Day to all dad! As always, we at the center had prepared art & craft project with the kids for their dearest daddy. Please click here to view some of the picture of the card that we had prepared. 5. Smart Reader Kids Day! School Holiday Program in June 2011! * Free Dictionary while stock last. Intensive 'Bahasa Malaysia' Reading Classes! 3-Days Art & Craft Workshop! * All material provided! RM20 rebate for registration before 20 May 2011. Seats are limited. Contact us to know more about these program. Let your children improve their reading skills & explore some creativity while meeting new friends during the holiday! See you there! On April 23rd, the world celebrates the World Book Day. We at the center also played our parts by celebrating it with our students for a free & easy reading session together. Click here to view the session pictures. Trip to Carrefour Shah Alam! As part of the learning activity, this month we had brought our S6 student for a short educational trip to Carrefour Shah Alam. The trip was guided by the manager in charge, briefing the kids on some of the 'day to day' product as we move around the store. Click here to view our short educational trip. 'Vitagen' had visited our center and gave talks on health matter to the kids. It was presented in a graphical way and quite fun to look at. At the end of the session, each of the kids get to test complimentary sample from Vitagen. We think the kids had enjoyed the session as well as the drinks. Please click here to view the photos taken during the session. Smart Bacaan Tutorial at our Center! 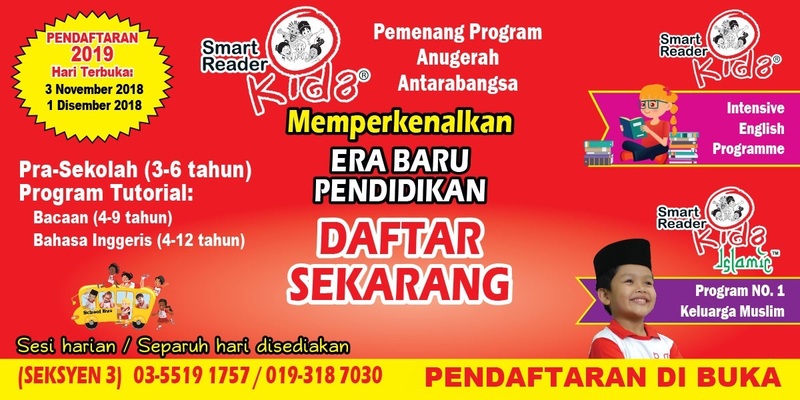 Smart Bacaan tutorial, a tutorial program that focus to provide foundation for young learners (age 4 to 9 yrs) to grasp reading skills in 'Bahasa Malaysia' will be introduce at our center. The tutorial program to be conducted 2 hours weekly on Saturday morning. For interested parents, kindly contact us or click here for more information on the program. It's Back to School time! We had missed you kids, hope it had been a very good holiday for all of you. Also we would like give our warm welcome to our new student. We hope this year will be much more fun for the kids as a lot of activities has been planned throughout the year. On other note, we have put up our Academic Calender 2011 for ease of reference. Please click here to view the calender.